The formation of Bruin Professionals (BP) is a result of identifying a need, within the UCLA Community, to create an Alumni Club dedicated to the development of business opportunities and relationships. It is a testament to the many skilled and talented professionals UCLA has in its Alumni. BP is comprised of UCLA graduates with multiple years of experience within their profession, who are in the position to both refer and act on referrals, and are willing to assist fellow Alumni. Through administrative contacts at the UCLA Alumni Association, Mike Anderson was introduced to fellow Alumni Randy Sheinbein; after both serving on several UCLA Alumni committees and attending various Alumni Association sponsored events, Mike Anderson and Randy Sheinbein discovered there were no effective organizations within the UCLA family that brought seasoned professional alumni together in an intimate setting to benefit and expand their businesses. Mike Anderson and Randy Sheinbein together were the pioneers in developing a conceptual plan for the formation of a UCLA Alumni based networking group, they were later joined by Mark Baker (not pictured) and Matthew Baker as the four original Founders of Bruin Professionals. This group utilized their many years of experience as members of other professional networking groups to create a master plan for Bruin Professionals. Initially, Bruin Professionals (BP) was formed as a Chapter under the umbrella of the Career Services Committee of the UCLAlumni Association. 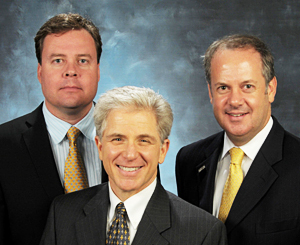 BP formed a Board of Directors consisting of Mike Anderson, Randy Sheinbein, Mark Baker and Matthew Baker. In September, 2002 approximately 80 guests were invited to the catered event in Westwood to launch Bruin Professionals. BP received tremendous support and encouragement from the Executive Board of UCLAlumni Association. In 2003, Bruin Professionals became an official UCLAlumni Club. BP conducts monthly meetings which include open networking, continental breakfast, a guest speaker, and each attendee has a 30 second professional presentation to the group. Additionally, there are sessions to present deals, needs and testimonials, a networking skills exercise and "mini" BP groups are arranged for smaller breakfast or lunch meetings. Throughout the year, BP organizes social events to further develop relationships outside of the business environment. The goal of Bruin Professionals is to encapsulate the synergy shared among UCLA Alumni to develop relationships and further their business activities through sharing referrals, resources, information, ideas, and advice. BP members are held to a standard of excellence, integrity and accountability. Today, Bruin Professionals has become a key element in the professional lives of many seasoned UCLA Alumni professionals and serves as a platform to benefit and expand their businesses and guide their clients.